Dr. J. Whitridge Williams’ 1914 book is an account of his dream, his motives, methods and the enduring impact of his new and profitable business model for general hospitals in Americans. The lynch-pin of Dr. JWW’s business plan was to invent a new and profitable category of hospital patient – the electively hospitalized healthy childbearing woman as a paying customer. The idea of electively hospitalizing healthy patients changed the business model of American hospitals from one that was drowning in its own red ink to that financial solvency. In 1914, the typical hospital patient was gravely ill or injured and would be in the hospital for weeks or months. Even if they didn’t die, they needed a lot of intensive, expensive care that they were unable to pay for. Dr. JWW suddenly came up with a brand new idea for how to run a hospital as a profitable business. Hospital administrators were no dummies, and they instantly realized the benefit of expanding their hospital’s acutely ill demographic to include a large percentage of ‘paying customers’ and monetize ancillary (non-medical) services. Certainly, this was a Eureka moment for the entire industry. 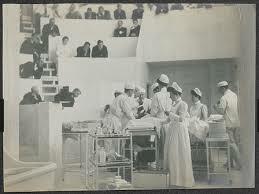 In addition to lying-in wards for healthy childbearing women, hospitals began to provide outpatient laboratory and x-ray services, diagnostic tests and procedures, cafeterias for the public, gift shops, valet parking, parking garages and elective hospitalization for cosmetic surgery. Bundled together, the category of elective hospitalization of paying customers for private hospitals was nothing financial short miracle. The beating heart of this new paradigm was especially the million maternity patients that give birth in a hospital each year, and charges for those million-plus newborn babies in the hospital nursery charges — and all done with a cent of public money or whiff of ‘socialized medicine’, which made the AMA ecstatic. 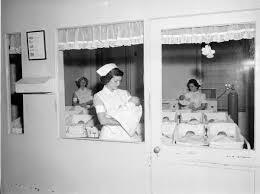 By the early 1920s, the new baby business, combined with other types elective hospital care, outpatient services and non-medical profit centers such as dining rooms, parking garages, and gift shops quickly became the economic model for our 20th and 21st-century for-profit hospital system. Unfortunately for us, Dr. J. Whitridge Williams’ plan was a two-edged sword. He was a true hero that achieved wonderful things for the nation by providing dependable access to state-of-the-art hospital services within reasonable driving distance. Over the last century, this certainly has saved several million lives. But at the same time, Dr. JWW was also a villain. His economic “plan” for electively hospitalizing healthy maternity patients resulted in the most profound change in normal childbirth practices in the history of the human species. On his watch, healthy childbearing women were turned into patients of the new surgical specialty of obstetrics and gynecology and normal childbirth became a surgical procedure ‘performed’ by a physician using forceps on a mother rendered unconscious by general anesthesia. “In Johns Hopkins Hospital,” said Dr. Williams, “no patient is conscious when she is delivered of a child. She is oblivious, under the influence of chloroform or ether. Today over 4 million women (70-80% healthy with normal pregnancies) have hospital births every year. Instead of chloroform, up to 95% of labor patients are given epidural anestheria. And like a magic trick for the hospital, this biological process automatically makes a second ‘paying customer’ — the new baby that is officially and financially admitted to a hospital nursery. 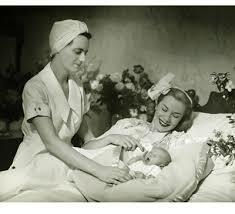 Maternity care accounts for 8 million annual admissions out of a yearly census of 30 million hospital patients. For decades, ‘normal childbirth’ and ‘newborn’ have been the two most frequent admission diagnoses. In second place award goes to angioplasty procedures, with a paltry is 700,000 a year. Dr. JWW’s plan to use electively hospitalized maternity patients as the cash cow of hospitals as profit-making businesses is still alive and well in the 21st century. Early in the 20th century, Dr. J. W. Williams invented the economic engine that first created and now maintains America’s private and corporately-owned hospital system. This certainly is an odd heritage for a professor of obstetrics and Dean of Johns Hopkins’ prestigious School of Medicine, but the circumstances for him were compelling: Dr. Williams’ was a visionary whose private dream and goal as a patriotic American was a nation-wide system of modern, full-equipped general hospitals in every community with a population of more than 3,000. These new and upgraded hospitals had to be able to provide comprehensive medical and surgical services to the general public, as well as round-the-clock emergency services. His goal was to make fully-equipped, state-of-the-art general hospitals available all across the country. He envisioned a general hospital in every town of 3,000 or more, to become as “ubiquitous if not quite as abundant as schools and libraries”. This had long been the standard of care in European countries, but the United States was still 200 years behind this curve. “With this kind of dependable patronage, lying-in hospitals would be able to “… provide laboratory, x-ray and other services necessary to provide for a well-equipped surgery department”. Obviously, healthy childbearing women are not sick, which meant they didn’t require expensive medical attention or time-consuming nursing care. After giving birth, all they needed was a dry bed, clean linens, hot meals and occasional help to the bathroom. So 40% (instead of just 5%) of the steady stream of revenue they generated could be used for upgrading existing hospitals and building brand new fully equipped general hospitals. By dramatically increasing the hospital’s profitability, elective maternity hospitalizations would become the economic engine of a profitable private hospital system. This story starts with Dr. J. Whitridge Williams, who was the most famous and influential obstetrician of his day, and author of the medical school textbook “Williams’ Obstetrics”. After graduating from John Hopkins’ School of Medicine in 1888, Dr. JWW began his climb to prominence by setting up the gynecological surgery department for Johns Hopkins, a brand new hospital on the University’s campus in Baltimore that opened in 1893. 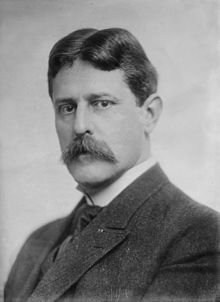 Next, he was appointed Chief of obstetrics at Johns Hopkins University Hospital, and finally Dean of the medical school in 1910. He and Dr. Joseph De Lee were described at the time as the two “Titans of American Obstetrics“. When Dr. Williams first graduated from medical school he sailed to Europe so he could take clinical training in pathology and obstetrics. At that time, there was little to no clinical training available in American medical schools, mainly because there were no hospitals with a large patient census to provide ‘teaching cases’. As Dr. JWW rotated thru the obstetrical departments of big busy hospitals in Germany, France, and Vienna, he realized that hospitals in Europe were remarkably different than those in the US. Nearly all the countries of Western Europe had a national system of very large “general” hospitals. These enormous institutions could deal with any type of medical, surgical, pediatric, obstetrical or emergency situation and at the same time, they functioned as medical school training centers. Dr. Williams was very impressed with the quality and quantity of medical services available to the population of each country. He was also excited about the opportunities for clinical training these big hospitals provided to medical school student and graduate students like himself and acutely aware the US had nothing that compared. America hospitals in the early 2oth century in the US were plentiful (one estimate was 8,000), but they were just tiny 2-to-10 bed facilities privately owned and run by the town doctor. These overnight clinics and one-room hospitals could not afford to buy state-of-the-art medical equipment (ex. x-ray machines, microscopes, autoclaves), nor did they have an emergency room. As for-profit businesses, they didn’t provide care to anyone who couldn’t pay out of pocket at the time of service. The only exception to this sorry state of affairs was a dozen or so large charity hospitals (usually supported by the Catholic Church) in the biggest cities of the Eastern seaboard, Chicago, New Orleans, Denver, and on the West Coast, Washington State, SF and LA. Dr. Williams’ dream was to match the system used in Europe in the US, so Americans were not dying needlessly because the nearest well-equipped general hospital was 300 miles away. However, the problem Dr. Williams’ identified was real and was in part a result of the new, world-altering discoveries of biological science made during the late 1800s (Pasteur’s germ theory of infectious disease in 1881 and the discovery of x-rays 1895), creating a miniature Tsunami in “must have” technology. For the first time ever, revolutionary and life-saving breakthroughs in health care depended on large capital outlays for special equipment, which made running a hospital ever so much more expensive. This kind of technologically-enhanced care was not available in this tiny 2-10 bed one-room private hospitals owned and run by the town doctor. 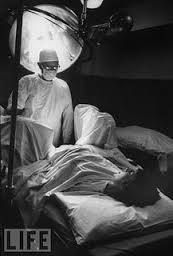 Every ‘modern’ hospital suddenly had to have autoclaves for their surgical instruments, laboratories had to be equipped with microscopes and sterilizers, and radiology departments needed several expensive x-ray machines, lead aprons, and oceans of photographic film. Of course, hospitals had to be remodeled to include operating rooms and other specialty areas and all these new services needed new buildings to house them in. The miracles of modern medicine didn’t come cheap! By 1910, hospitals of all kinds — big charitable institutions, teaching hospitals run by universities and small for-profit hospitals — were all bleeding red ink. For centuries, hospitals as charitably-run places of ‘hospitality’ were labor-intensive but the cost of care was relatively low in a pre-technological world — all that was needed was a host of unskilled and semi-skilled service worker who served hot meals, clean sheets, back-rubs and emptied bedpans, etc. But the discoveries and technologically-enhanced diagnostic and treat methods made ‘modern’ hospitals very capital-intensive enterprise within 10 or 15 years. In addition to the purchase of expensive equipment, hospitals had begun to promote themselves as able to cures disease (rather than just hotels with medical room service). This introduced the unwelcome and burden of legal liability for bad outcomes and adverse events. Lacking a public tax-supported national system as existed in many parts of Europe, the technologically-rich hospital business in the US was forced to look to their patients, which by definition are people that are sick, injured, crazy or infected w/ communicable diseases like TB. It became increasingly clear that hospitals could no more depend on the seriously ill or injured to pay for their care than prisons can expect their inmates to reimburse them for the cost of their incarceration. The conclusion was inescapable — without a public tax base, there were just not enough sick people (as paying customers) to support 20th century ‘modern’ medicine. The seemingly insurmountable problem was money — how to finance a nation-wide system of general hospitals? While his idea for hospitalizing healthy childbearing women seems quaint and inexplicable at first glance, Dr. Williams was proposing a solution to a historical problem of great importance that has been invisible to all the rest of us (even my personal hero, Paul Starr, author of The Transformative Social History of Medicine). Most contemporary Americans are steeped in the idea that normal childbirth is exceedingly dangers, making hospitalization a ‘no-brainer’, but the problem and its solution views by Dr. Williams perspective was very different. Dr. JWW’s idea of elective hospitalization of maternity patients had little or nothing to with today’s mantra about hospitals as safety zones for childbirth. Considering that in 1914, a third of all deaths in hospitalized maternity patients were from sepsis (10,000 out of 25,000 maternal deaths a year), no one, not even Dr. Williams, could or would claim credibly that hospitalizing healthy women during this pre-antibiotic era was primarily for their safety. What he said instead makes the story even more interesting. In addition to the economic aspect at the heart of his plan, was the politics of eugenics in a perverse and upside down way. One of his arguments could have been ripped from today’s headlines about “anchor babies” — the fear that the birth rate of the lower classes and working poor and non-white ethnic minorities — will outstrip the number of babies being born to the more desirable white population. In maddeningly creative ways, Dr Williams pursues his main goal — a national system of lying-in hospitals — by harking on the sacred duty of maternity, inventing a pathological origin for the pain of normal childbirth in healthy middle and upper-class white women and then using this made-up story about the pathology of normal pain in this demographic of paying customers his main selling point for hospitalized childbirth (hence his book promoting ‘painless childbirth’). Dr. Williams’ solution to this dilemma — not enough paying customers to support the business model a first class “modern’ hospital — was to devise a plan to convince healthy middle & upper class white women to have their babies in a new system of lying-in ward in existing hospitals, or new ‘maternity’ hospitals (more of the 2-10 bed one-room variety owned and run by the town doctor) as the first step to financing a bigger regional general hospital. Ideally, these would become a numerous as schoolhouses and libraries, with at least one lying-in hospital in every country seat. Unlike illness, which is seasonal, and injury which is erratic and unpredictable, childbirth, postpartum maternity care and nursery care of newborns is a steady, dependable (pre-birth control) and a stable year-round source of patronage, thus providing the bread and butter income for hospitals. The biggest stumbling block was organized medicine. The AMA has always been fiercely opposed to any ‘meddling’ by the government in medical care or the financing of hospitals. Many doctors saw the practice of medicine as a small business and themselves as owners and entrepreneurs. Any attempt by the government to own and operate hospitals paid for by public taxes was called “socialized medicine”, which was an insult. The mere suggestion that the government would inject itself into in any way into the ‘business’ of medicine, thus interfering in the sacred “doctor-patient relationship”, was so repugnant that doctors, via the AMA, were willing to fight to the death. Unfortunately, as Dr. Williams knew only too well from first-hand experience, it was not their own deaths but those of other people who could not afford to pay out-of-pocket. Worse yet, these deaths would be the very worst kind for a doctor — totally preventable if the patient had timely access to state-of-the-art medical services. So Dr. Williams came up with a brilliant (if somewhat Machiavellian) idea that turned out to be extraordinarily effective. He invented the idea of ‘elective hospitalization’ for health maternity patients as a way to turn hospitals into a profitable business venture. This would allow small hospitals with new and profitable maternity wards to remodel, expand, buy new, capital-intensive equipment (like x-ray machines) and have state-of-the-art operating rooms. All he needed to do was convince doctor-owned one-room hospitals to expand into the ‘baby business’ by adding a “lying-in” ward. The revenue stream generated by the elective hospitalizations of these healthy women would allow these institutions to become new general hospitals with upscale laboratory equipment, X-ray services, updated ORs, pediatric care, medical and surgical patient beds, etc. Dr. Williams dream was to have at least one general hospital in every population center over 3,000. He calculated the average birth rate per country (700), and figured that if just half those women (350) could be convinced to have a hospital birth, the cost of their delivery, a 14-day postpartum stay for the mom and 14 days in the hospital nursery would generate 9,800 billable ‘patient census’ days. At just $3 dollars a day ($2 for mom, $1 for nursery care), each hospitalization would only cost the family about $84, but would generate tens of thousands of dollars a year for the hospital. In 1914 dollars, this was impressive. While Dr. Williams’ idea is inexplicable at first glance, he was proposing a solution to a historical problem of great importance that has been invisible to all the rest of us (even my hero, Paul Starr). What is most surprising is that the problem Dr. J. Whitridge Williams saw was very different from what we would have expected, since it had virtually nothing to with today’s mantra about hospitals being places of safety for childbirth. Considering that in 1914, a third of all maternal deaths in hospitalized maternity patients was from sepsis (10,000 out of 25,000 deaths a year) not even Dr. J. Whitridge Williams claimed that hospitalizing healthy women during this pre-antibiotic era was primarily for their safety. What he said instead makes the story even more interesting, as it included the politics of eugenics in a perverse and upside down way. The theory behind his arguments could have been ripped from today’s headlines about “anchor babies” — that is, the fear by white anglo-Americans that the birth rate of the lower classes — working poor and non-white ethnic minorities — would outstrip the number of babies being born to the more desirable white population and therefore we have to convince white middle and upper class women to have more babies. However, white nationalism was only a background motive. Dr. JWW’s real passion was developing a reliable way to finance a nationwide system of general hospitals that didn’t involve the government. His connection with maternity patients was primarily opportunistic — a way to generate revenue for his project — a hospital system that matched the system that’d been using in Europe for more than 200-years. Dr. Williams began his two-step plan by first convincing the doctors who own the thousands of tiny 2-10 bed hospitals all over the country that they should add a “lying-in” ward (i.e. maternity department) to their existing facility. This, in turn, would generate the revenue needed for these small and medium-sized hospitals to become a fully-equipped general hospital. This was the critical element needed to create a nation-wide system of general hospitals without depending on any public money, government financing (the dreaded ‘socialized medicine’). Elective hospitalization of maternity patients was just a stepping stone in a plan with a lot of moving parts. Then he had to convince healthy middle and upper-class women to agree to be electively hospitalized AND get their husbands to pay for these hospital-based services. 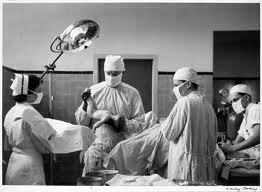 To do this, Dr. Williams promoted the idea that the female of the species women had a “sacred duty of maternity”. But the strongest part of his pitch for elective hospitalization was a very ‘creative’ story of his own invention — that the negative evolutionary effects of civilization had recently made the pain of childbirth in middle and upper-class women dangerously pathological. As a result, this previously unknown ‘complication’ of normal labor and birth in a healthy woman could easily result in a nervous (or mental) breakdown so severe they might have to commit the new mother to an insane asylum. This form of pathological childbirth pain was a particular danger for what Dr. Williams described as the more ‘delicate’ and ‘intellectual’ women, who must be protected from such a danger by being given Twilight Sleep drugs (narcotics and scopolamine) during labor and general anesthesia during the “delivery”. Then Dr. JWW used this same invented explanation (the ‘pathology’ childbirth pain of in smart delicate white women) to convince husbands to pay for such care, making sure they understood that if they didn’t agree to hospitalize the little woman, she just might go crazy from the pain and leave them to take all of 6 kids while she languished in mental hospital. This explains why Dr. JWW wrote a book promoting ‘painless childbirth’ as the first step in his attempt to finance a national hospital system. However, the actual problem that Dr. Williams’ identified brought to light was the miniature Tsunami in “must have” medical technologies brought about by the world-altering discoveries of biological science made during the late 1800s (Pasteur’s germ theory of infectious disease in 1881 and the discovery of x-rays 1895). For the first time ever, revolutionary and life-saving breakthroughs in health care depended on large capital outlays for special equipment, which made running a hospital ever so much more expensive. Every hospital suddenly had to have autoclaves for their surgical instruments, laboratories had to be equipped with microscopes and sterilizers, and radiology departments needed several expensive x-ray machines, lead aprons, and oceans of photographic film. Of course, hospitals had to be remodeled to include operating rooms and other specialty areas and all these new services needed new buildings to house them in. The miracles of modern medicine didn’t (still don’t) come cheap! By 1910, hospitals of all kinds — big charitable institutions, teaching hospitals run by universities and small for-profit hospitals — were all bleeding red ink. For centuries, hospitals as charitably-run places of ‘hospitality’ were labor-intensive, but the kind of care did not require any special education or technical skills. All a 19th-century hospital needed was a host of unskilled and semi-skilled service worker who served hot meals, clean sheets, back-rubs and emptied bedpans, etc). 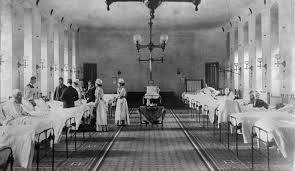 But between 1881 and 1900, hospitals were increasingly capital-intensive enterprises. In addition to expensive equipment, hospitals had begun to promote themselves as able to cures disease (rather than just hotels with medical room service). This introduced the unwelcome burden of legal liability for bad outcomes and adverse events. Lacking a tax-supported national system as existed in Europe, the technologically-rich hospital business in the US was forced to look to their patients, which by definition are people that are sick, injured, crazy or infected w/ communicable diseases like TB. It became increasingly clear that hospitals could no more depend on the seriously ill or injured to pay for their care than prisons can expect their inmates to reimburse the costs of their incarceration. The conclusion was inescapable — sans a tax base, there were just not enough sick people (as paying customers) to support 20th century ‘modern’ medicine. Dr. Williams’ solution to this dilemma — not enough paying customers to support the business model for a first class hospital — was to devise a plan to convince healthy middle & upper class white women to have their babies in a new system of lying-in hospital that ideally would be placed “as uniformly, if not quite as abundantly, as schoolhouses and churches”, with at least one hospital in every country seat. Unlike illness which is seasonable and injury which is erratic and unpredictable, childbirth, postpartum maternity care and nursery care of newborns is steady, dependable (pre-birth control) and a stable year-round source of patronage, thus providing the bread and butter income for hospitals. Dr. J.W. Williams calculated that the average county had a population of 20,000 inhabitants, with an annual birth rate of 700. He reasoned that if even half of these childbearing women (350) could be convinced to have babies in the hospital (and their husbands cajoled into paying), it would create a solid economic basis for the business model of lying-in hospitals. “… provide laboratory, x-ray and other services necessary to provide for a well-equipped surgery department”. Convincing MEN to pay for all this! Part of JWW’s inducement to husbands, public officials, and philanthropists (whose capital endowments he was soliciting) was to promote the benefits his new system of lying-in hospitals to men and other segments of society. In other words, maternity care for a healthy population was seen as the seed money or financial leavening that would give rise to a full-service community hospital with a surgery department, labs, x-ray and other services used by healthy people from the community as well as the in-patient population. In a remarkable bit of reverse engineering, he turned the story as we think of it today on its head. To our modern perspective, this seems like a “tail wagging the dog” scenario, but in his version, the ‘tail’ was what we now think of as the full-service community hospitals. It was the baby business that made everything else possible. I once heard a joke that sort of explains this. It was about a guy who worked in a big factory with guards on the gate. All employees were searched as they left work each day to be sure they were not stealing anything. However, one particular a worker left with a wheelbarrow full of empty boxes everyday day; the guards carefully searched each and every container to be sure there was nothing of value in any of them. The worker says: “I was stealing wheelbarrows“. In the 1990s, I read a report on hospital economics that identified the most and least profitable of a hospital’s services. Hospital make 38 cents profit on the dollar for maternity patients, but only 5 cents profit for patients that had cardiac surgery. I think they’re stealing wheelbarrows. The US spends 2.43 TRILLION every year on health care (25% of this is maternity services), which makes this more than just a story of obstetrics on steroids. It explains something that has been invisible to us, like the water in the fish bowl. 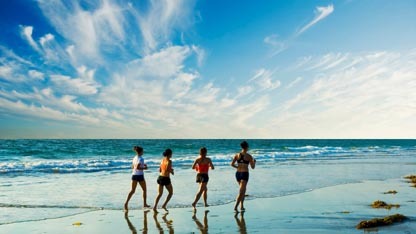 We all swim around in the issue of modern technologically-enriched hospitals as the core of our ‘health care’ system. But we didn’t realize that the word ‘health’ had a hidden dimension — as an economic model, hospital administrators have to figure out how to market their services to healthy people who can afford to pay for them. In this model, sick people who can’t pay also don’t get the care they need (no matter how urgent), while healthy people who can pay get medical care they didn’t need and don’t benefit from. Realistically, we must either to continue using healthy maternity patients as the economic backbone of our healthcare system or look for other ways to support our technologically-enriched system. In the end, we can all pay our fair share each year. For some its when we pay our taxes; for others its when we write out a check each month to our insurance company for our own plus an inflated share of the nation’s healthcare debt. Once you know that the real problem is an insufficient number of sick people who are also rich, you can’t help but look differently at our current system in which EVERY hospital has to have one of EVERY machine. As a fan of “Royal Pains” — a TV series about a concierge’s doctor in The Hamptons — we might consider putting those big MRI machines in a classy 18 wheeler and sharing expensive equipment between smaller community hospitals.